Padre Burgos Street stretches from Roxas Boulevard to Plaza Lawton and the Manila Central Post Office. Along its western side is the golf course surrounding the walled city of Intramuros. It is one of the more picturesque streets in Manila considering travelers would have a view of the walls of Intramuros on one side and historic buildings and a park on the other. Following are a few photos I took on my way back from a meeting at the DPWH Head Office along Bonifacio Drive. The northbound side of P. Burgos St. has 4 lanes and intersections are signalized. The street has a median island (on the left) dividing opposing traffic flows. The traffic lights shown are for the intersection with the Finance Road, which leads to the Ayala Boulevard. 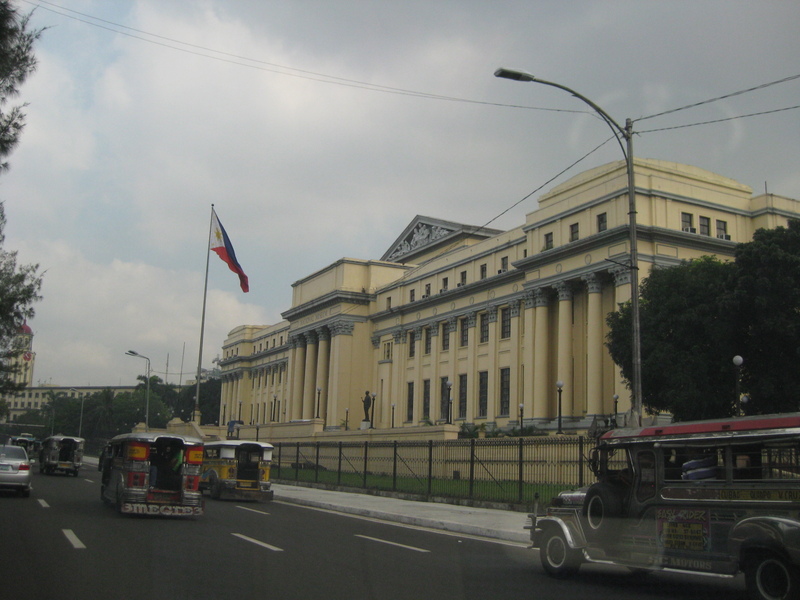 On the right, travelers will see the National Museum building, which used to host the Senate of the Republic of the Philippines. The Manila City Hall’s clock tower is one of the most familiar landmarks in Manila, seemingly unchanged through so many years. P. Burgos Street splits up into three sections, all named the same: the left leads to the Jones Bridge and Quintin Paredes Street, the center leads to McArthur Bridge and Rizal Avenue, and the right leads to Quezon Bridge and Quezon Boulevard. At center in the photo is the Manila Central Post Office building in front of which is Plaza Lawton, named after the highest ranking American officer killed in action during the Philippine American War. Visual intrusion? Obstruction? The video screen installed where P. Burgos splits up to McArthur Bridge and Quezon Bridge obscures what many would consider as a nice view of the Manila Central Post Office. At the right of the photo is another historic building that has been neglected – the Metropolitan Theater. Park and ride facility along P. Burgos St. Behind the structure is the Central Station of LRT Line 1. By d0ctrine in Highways and Streets, Land use on February 8, 2013 .